Roscosmos has successfully sent its newly upgraded Soyuz MS series vehicle – and three crew members – to the International Space Station. 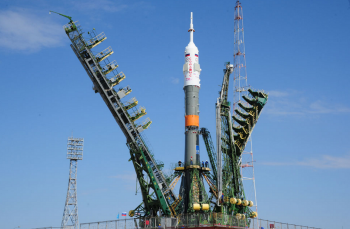 The three crew members from three nations lifted off from the Baikonur Cosmodrome in Kazakhstan at 01:36 GMT on 7 July ahead of completing a two-day rendezvous profile to dock with the Station at 04:06 UTC on Saturday. Launch of the Soyuz MS-01 mission marked the 130th flight of a Soyuz vehicle since they entered service in 1967 and is also serving as the introduction of a new variant Soyuz. The MS variant is the last in a series of planned upgrades for the veteran Soyuz vehicle of the Russian Federal Space Agency (Roscosmos). Moreover, its main computer, a TsVM-101, weighs one-eighth that of its predecessor (8.3 kg vs. 70 kg) while also being much smaller than the previous Argon-16 computer. This new MS-series Soyuz also uses a unified digital command/telemetry system that allows telemetry to be relayed via satellite for control of the spacecraft as well as to provide crew with positioning data when the spacecraft is out of range of ground tracking stations. Furthermore, the GLONASS/GPS and Cospas-Sarsat satellite systems have also undergone major upgrades to provide more accurate location services during search/rescue operations after landing. To this end, only minor changes for the MS Soyuz series based on flight data/behavior are planned before the entire Soyuz vehicle family is retired. While no date (not even a notional one) has been set for that retirement, it is currently understood that the Soyuz vehicles will be replaced by the Federation vehicle – a multi-person, partially reusable piloted spacecraft envisioned by Roscosmos to allow for the continuation of Low Earth Orbit transportation as well as lunar missions. 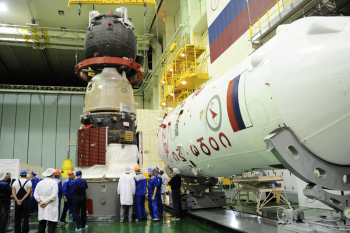 Originally scheduled to launch on 24 June, the debut of the MS Soyuz series encountered a setback on 1 June when engineers announced the discovery of a potential issue within the software of the spacecraft. After several days of testing, Roscosmos officially postponed the Soyuz MS-01 launch to 7 July – which thereby forced a launch delay for an unmanned Progress MS vehicle from 7 July to 17 July. On 23 June, Roscosmos, NASA, and their international partners convened the Flight Readiness Review at the Johnson Space Center in Texas and officially set 7 July as the target launch date for Soyuz MS-01. The following day, the three person crew (and their back-ups) arrived at the launch site in Baikonur for final pre-launch activities and quarantine. On 28 June, Roscosmos engineers successfully mated the Soyuz MS-01 spacecraft to its adaptor, that will hold it firmly atop the Soyuz booster during launch. At the close of June, the prime and backup crews performed final simulations for manual docking procedures of the Soyuz MS while engineers conducted the final series of pre-mating systems checks on the Soyuz MS-01 before placing it inside its payload fairing. Over the next three days, engineers completed integration of the Soyuz’s escape tower to the top of the fairing assembly as well as fairing assembly integration to the third stage. 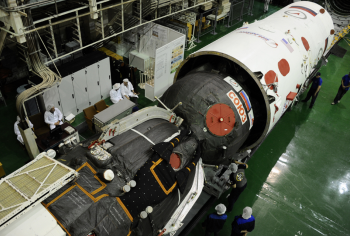 On 3 July, teams completed final assembly of the Soyuz MS-01 launch vehicle with mating of the upper composite to the main core of the Soyuz FG rocket. Under nearly clear skies, the Soyuz MS-01 launch vehicle was transported to the launch site on 4 July ahead of final pad checkouts and fueling operations for launch. Following standard countdown operations, the Soyuz booster launched from Pad No. 1 at the Baikonur Cosmodrome at 07:36 Moscow time (01:36 GMT – 21:36 EDT). After an eight minute ascent, the booster inserted the MS-01 Soyuz and its three person crew into a standard, two-day Station rendezvous orbit. Like its immediate predecessor, the Soyuz MS series carries the capability to perform same-day docking ascent profiles. 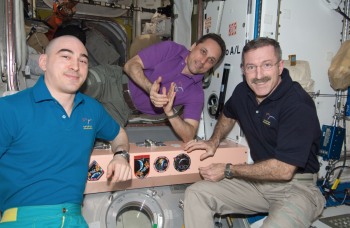 However, because this is the first flight of the crewed MS series vehicle, a two-day rendezvous was deemed necessary to allow the crew to fully test all of the new systems and ensure that all is working as designed. After two days, Soyuz MS-01 arrived underneath the ISS and navigated toward the nadir port of the Rassvet module ahead of a successful docking. Assuming a proper mission, Soyuz MS-01 will remain docked to the Station until at least November 2016 for a roughly four month stay at the orbiting laboratory. 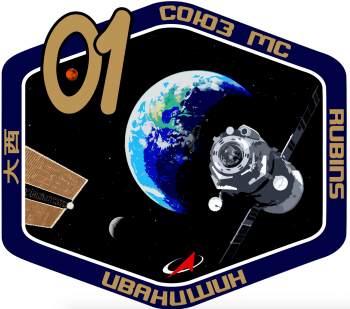 For the duration of its mission, Soyuz MS-01 will carry a call sign of Irkut – a river in the Buryat Republic and Irkutsk Oblast of Russia, which contains the hometown of Soyuz MS-01 Commander Anatoli Alekseyevich Ivanishin. Ivanishin is a veteran of one previous spaceflight, Soyuz TMA-22 – during which he served as Flight Engineer for Expeditions 29/30. 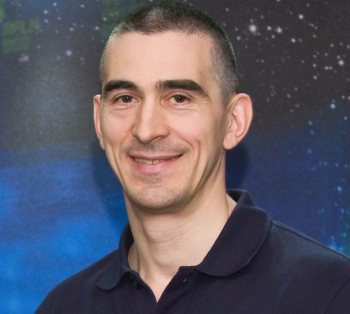 Ivanishin was born in Irkutsk on 15 January 1969 and entered the Irkutsk Polytechnic Institute in 1986 before successfully gaining admission to the Chernigov Higher Aviation School in 1987. He graduated from Chernigov in 1991 with a gold medal, after which he served in combat units of the Russian Air Force flying MiG-29s. Beginning in 1992, he served as a senior fighter pilot in the 159th Fighter Aviation Regiment, where he flew Su-27 jets. In 2003, he graduated from Moscow State University with degrees in Economics, Statistics, and Information Technology. Upon graduation, he entered cosmonaut candidate training on 16 June 2003. Two years later, he passed all state examinations with an “excellent” rating. Ivanishin’s first assignment was as backup commander for the Soyuz TMA-20 mission – which successfully launched to the ISS on 15 December 2010. After this, Ivanishin was assigned to Soyuz TMA-22 – the final flight of the Soyuz-TMA vehicle. As a Flight Engineer for Expeditions 29/30, Ivanishin spent 165 days 7 hours and 31 minutes in space, launching on 14 November 2011 and returning to Earth on 27 April 2012. Upon arriving at the Station in MS-01, Ivanishin will take up the designation of Flight Engineer 4 for Expedition 48. In September, he will assume command of the ISS from NASA astronaut Jeff Williams and will serve as Commander of Expedition 49. Joining Ivanishin on Soyuz MS-01 is Takuya Onishi, a member of the 2009 JAXA astronaut group who will be making his first trip to space. 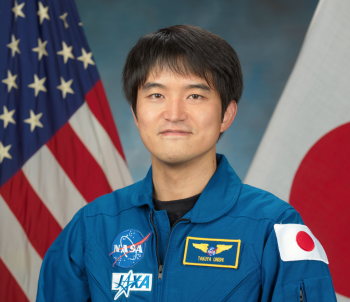 Prior to his selection as a JAXA astronaut, Onishi earned a Bachelor of Engineering degree in Aeronautical and Space Engineering from the University of Tokyo in 1998 before going on to receive basic flight training in the U.S. and advanced flight training in Tokyo. From 2003 to 2009, Onishi served as co-pilot for domestic and international Boeing 767 flights from Japan. In February 2009, he was selected as a JAXA astronaut candidate for the International Space Station and undertook basic astronaut training at the Tsukuba Space Center in Japan before reporting to the Johnson Space Center in August 2009. After completing astronaut training, Onishi was assigned to the Aquarius underwater laboratory NEEMO 15 mission. NEEMO 15 lasted from 20-26 October 2011 – starting one day late because of inclement weather and ending four days earlier than planned due to the approach of Hurricane Rina. 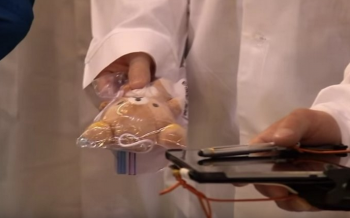 For the Soyuz MS-01 launch, the zero gravity sensor mascot was chosen by Onishi’s daughter and will be a teddy bear named Rilakkuma, a fictional character produced by the Japanese company San-X. When Onishi arrives at the Station, he will officially become a member of Expedition 48, taking the position of Flight Engineer 5. In September, he will transfer to Expedition 49 as Flight Engineer 2. Rounding out the Soyuz MS-01 crew is NASA astronaut Dr. Kathleen Rubins. 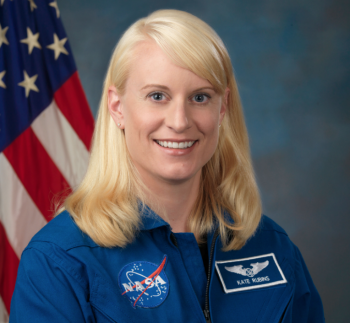 Selected as an astronaut candidate in July 2009 as part of NASA’s 20th astronaut class, Rubins came to NASA with a Bachelor of Science degree in Molecular Biology from the University of California, San Diego and a doctorate in Cancer Biology from Stanford University Medical School Biochemistry Department and Microbiology and Immunology Department. Her undergraduate Bachelor degree research centered on HIV-1 integration, during which she analyzed the mechanism of HIV integration, including HIV-1 Integrase inhibitors and genome-wide analyses of HIV integration patterns into host genomic DNA. During her doctoral research, she worked with the U.S. Army Medical Research Institute of Infectious Diseases and the Centers for Disease Control and Prevention, where she and her colleagues developed the first model of smallpox infection as well as a complete map of the poxvirus transcriptome, which allowed her to study virus-host interactions using both in-vitro and animal model system. Following her doctoral work, Dr. Rubins accepted a Fellow/Principal Investigator position at the Whitehead Institute for Biomedical Research, where she headed a group of researchers studying viral diseases that primarily affect Central and West Africa. This work focused on poxviruses and host-pathogen interaction as well as viral mechanisms for regulating host cell mRNA transcription, translation, and decay. In addition to this, Dr. Rubins conducted research on transcriptome and genome sequencing of the Ebola and Marburg viruses as well as Lassa Fever while performing collaborative projects with the U.S. Army to develop therapies for Ebola and Lassa viruses. Her work to date has been published in numerous international scientific journals. For her school and work accomplishments, Dr. Rubins has been honored with the following: Order of Omega Honor Society Scholarship Award (1998), UCSD Emerging Leader of the Year (1998), the Stanford Graduate Fellowship ‐ Gabilan Fellow (2000), a National Science Foundation Predoctoral Fellowship (2000), and the Popular Science’s Brilliant Ten award (2009). 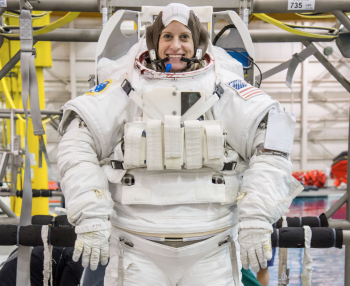 When Dr. Rubins arrives aboard the Space Station, she will join Expedition 48 as Flight Engineer 3. 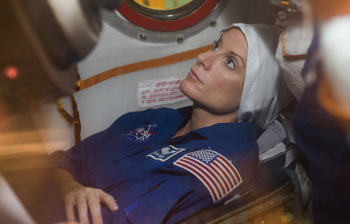 Then, in September, she will transfer to Expedition 49, during which she will serve as Flight Engineer 1.